All new and additional electrical work carried out will comply to BS 7671 IET wiring regulations. On completion of all new work the certificates will be provided to the customer and the relevant work will be registered with the local building control office through the NIC-EIC. 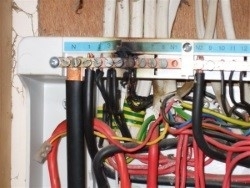 Even an installation installed 15 years ago can develop faults as seen in this picture so this is why it is recommend that a full electrical installation condition report (EICR) should be carried out periodically to prevent any possible cause of fire and reduce the risk of injury. Call us today on 07973 329696 or visit our contact page and fill out the form to discuss all your needs and requirements in further detail.